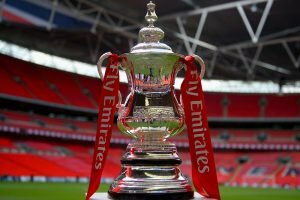 Fleetwood Town travel to non-league Guiseley in the second round of the FA Cup, after the draw was conducted on Monday night. Guiseley edged Cambridge 4-3 in a thriller in West Yorkshire to progress from the first round, while Fleetwood saw off Alfreton 4-1 at the Impact Arena. Elsewhere, there is a Welsh derby in the offing, as Newport travel to Wrexham, while there is a potential all Merseyside clash between Southport and Tranmere, if Rovers can see off Oxford City. Sunderland face a trip to Walsall, while Portsmouth travel to Rochdale in two all League One ties.